Start off your visit on the 8th (Sat): take a stroll through Ladd's Addition, admire the natural beauty at International Rose Test Garden, and then identify plant and animal life at Oaks Bottom Wildlife Refuge. 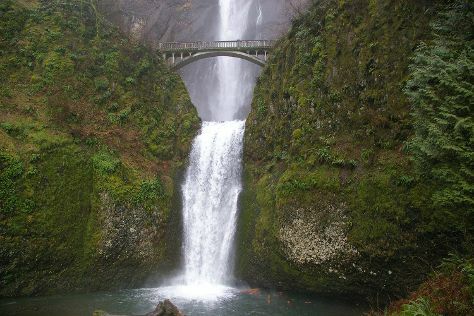 Get ready for a full day of sightseeing on the next day: take in nature's colorful creations at Portland Japanese Garden, then contemplate the long history of Pittock Mansion, then admire the sheer force of Multnomah Falls, and finally contemplate the long history of Columbia River Highway. For ratings, more things to do, and other tourist information, refer to the Portland driving holiday website . Washington DC to Portland is an approximately 8-hour combination of train and flight. You can also fly; or drive. The time zone changes from Eastern Standard Time (EST) to Pacific Standard Time (PST), which is usually a -3 hour difference. Plan for slightly colder temperatures traveling from Washington DC in June, with highs in Portland at 77°F and lows at 56°F. Cap off your sightseeing on the 9th (Sun) early enough to go by car to Cannon Beach. Cannon Beach is a city in Clatsop County, Oregon, United States. Start off your visit on the 10th (Mon): take in the dramatic natural features at Haystack Rock, immerse yourself in nature at Hug Point State Park, and then immerse yourself in nature at Ecola State Park. Get ready for a full day of sightseeing on the next day: enjoy the sand and surf at Cannon Beach, immerse yourself in nature at Oswald West State Park, and then admire the majestic nature at Oswald West State Park. Plan trip to Cannon Beach with our itinerary maker to find out where to go and what to do. Getting from Portland to Cannon Beach by car takes about 2 hours. Other options: take a bus. While traveling from Portland, expect little chillier days and about the same nights in Cannon Beach, ranging from highs of 66°F to lows of 52°F. Cap off your sightseeing on the 11th (Tue) early enough to travel to Timberline Lodge. Start off your visit on the 12th (Wed): take in the awesome beauty at Timberline Lodge and Ski Area, then admire the sheer force of Little Zigzag Falls, and then look for all kinds of wild species at Wildwood Recreation Site. To find photos, ratings, maps, and other tourist information, go to the Timberline Lodge visit planner. Traveling by car from Cannon Beach to Timberline Lodge takes 3 hours. When traveling from Cannon Beach in June, plan for somewhat warmer days in Timberline Lodge, with highs around 72°F, while nights are about the same with lows around 55°F. 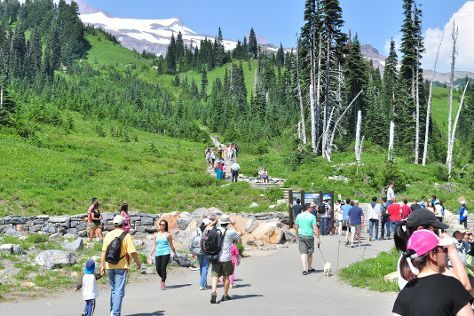 Finish your sightseeing early on the 12th (Wed) to allow enough time to travel to Mount Rainier National Park. Kick off your visit on the 13th (Thu): stroll through Paradise Loop, admire the sheer force of Narada Falls, and then trek along Skyline Trail. Keep things going the next day: take a peaceful walk through Grove of the Patriarchs, then trek along Trail of the Shadows, and then take in the awesome beauty at Mount Rainier. To see reviews, photos, maps, and tourist information, refer to the Mount Rainier National Park trip planner . Use the Route module to find suitable travel options from Timberline Lodge to Mount Rainier National Park. Traveling from Timberline Lodge in June, expect slightly colder with lows of 50°F in Mount Rainier National Park. Wrap up your sightseeing on the 14th (Fri) to allow time to travel to Friday Harbor. The tiny town of Friday Harbor is the largest village on the San Juan Islands, and it fits within just 2.6 km (1 sq mi) of space. Kick off your visit on the 15th (Sat): take in the history at American Camp, then don't miss a visit to English Camp, and then take a memorable tour with Tours. To see traveler tips, other places to visit, more things to do, and more tourist information, you can read our Friday Harbor trip site . Traveling by flight from Mount Rainier National Park to Friday Harbor takes 4.5 hours. Alternatively, you can do a combination of bus and flight; or do a combination of bus and ferry. June in Friday Harbor sees daily highs of 69°F and lows of 48°F at night. Cap off your sightseeing on the 15th (Sat) early enough to catch the flight to Seattle. 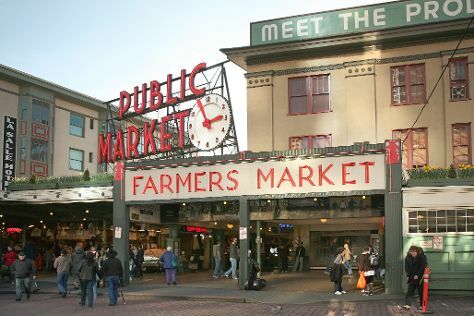 Start off your visit on the 16th (Sun): enjoy the sand and surf at Alki Beach, wander the streets of Pioneer Square, and then take a stroll through Pike Place Market. Get ready for a full day of sightseeing on the 17th (Mon): enjoy breathtaking views from Space Needle, look for all kinds of wild species at Mercer Slough Nature Park, and then see what you can catch with a fishing tour. For where to stay, photos, maps, and tourist information, use the Seattle trip planner. Traveling by flight from Friday Harbor to Seattle takes an hour. Alternatively, you can ride a ferry. Traveling from Friday Harbor in June, you can expect nighttime temperatures to be a bit warmer in Seattle, with lows of 57°F. Wrap up your sightseeing by early afternoon on the 18th (Tue) to allow enough time to travel back home.